The 1954 NCAA Men's Division I Basketball Tournament involved 24 schools playing in single-elimination play to determine the national champion of men's NCAA Division I college basketball. It began on March 8, 1954, and ended with the championship game on March 20 in Kansas City, Missouri. A total of 28 games were played, including a third place game in each region and a national third place game. La Salle, coached by Ken Loeffler, won the national title with a 92-76 victory in the final game over Bradley, coached by Forddy Anderson. 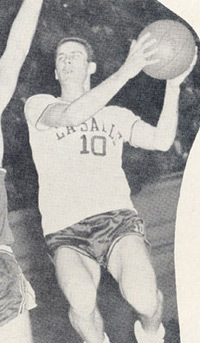 Tom Gola of La Salle was named the tournament's Most Outstanding Player. Of note, Kentucky, the top-ranked team in the nation (with a record of 25-0) did not participate in any post-season tournament. Since several key players had technically graduated the year before (when Kentucky was banned from playing a competitive schedule due to the point-shaving scandal a few years earlier), those players were ruled ineligible for the NCAA tournament. Despite the wishes of the players, Adolph Rupp ultimately decided his team wouldn't play. Despite a cancelled 1952–53 schedule, the Wildcats had stayed together and practiced regularly during their year off. No Rupp team was ever hungrier for an NCAA title. Tying LSU for the SEC championship (they didn't play during the regular season), the Cats beat the Tigers in a playoff to determine the NCAA qualifier. The NCAA, however, ruled that UK seniors Cliff Hagan, Frank Ramsey and Lou Tsioropoulos all had enough credits to graduate (which technically made them graduate students) and were ineligible to compete in postseason play.